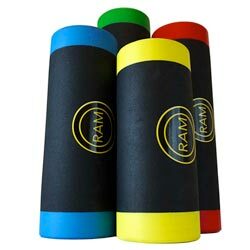 The RAMfit company has just launched a revolutionary line of 100% recycled fitness products that expand the use of foam rollers. The Ireland-based company is doing a limited launch of their products in early March 2017. TUSTIN, Calif. - Feb. 24, 2017 - PRLog -- RAMfit will be doing a limited launch of their RAMroller product in the beginning of March 2017. The launch is intended to get the product into the hands of fitness innovators who can make the best use of the versatility of the product. "Our products are made with less and designed to do more," stated RAMfit owner and inventor Dermot McArdle. "Our mission is to use the fewest possible materials to create fitness products that last for as long as possible and have as many uses as possible." The companies premiere product, the RAMroller, is made of solid rubber created from used car tires. Unlike typical foam rollers, the RAMroller weighs between 6kg (13lb) and 10kg (22lb), making it highly durable and useful for strength, conditioning, and power, in addition to recovery and myofascial release exercises. "The RAMroller never looses its shape and never needs to be replaced, making for huge cost savings for gyms, teams, trainers, athletes, and anybody else who operates in the world of fitness," stated Dermot McArdle. "Better yet, it can be used for rotational drills, high intensity training, slamming exercises, throwing exercises, and much more." RAMfit also offers the RAMboard, a 100% recycled balance board that pairs with any RAMroller. The board can be used as a typical balance board and can also be used for balance enhancing strength and partner drills. The RAMfit.com website contains hundreds of exercises and workouts that utilize both the RAMroller and RAMboard. The RAMfit company is based in Co Monaghan, Ireland and offers all of their products for purchase in Ireland, the United Kingdom, and the United States of America. The company has recently partnered with MegaMad Industries to promote both their products and training programs around the world. "I've used some very innovative products in the past, but few have reached the level of functionality and durability that the RAMroller has reached," stated Mark de Grasse, owner of MegaMad Industries. "The fact that the product is made from 100% recycled materials makes it unlike any product I've used in the past." Mark de Grasse is the former editor and owner of My Mad Methods Magazine and the original Chief Fitness Officer of Onnit Labs. He helped create the Onnit Academy and Onnit Academy Level One Certification and currently partners with innovative fitness companies to bring their products to market. RAMfit products are typically purchased by athletes, military/fire/police organizations, sports teams, gyms, strength and conditioning coaches, and physical therapists. Current customers include devonfitcamp, the Ministry of Defence, PureGym, and Sports Medicine Ireland.